Folks often ask me how much coffee to use when brewing. I used to give answers like “approximately 2 tablespoons per 6 oz. cup.” Then the inevitable follow-up question would be about how much to use when making a pot. I finally got tired of the confusion that would then ensue when trying to figure out what size coffee maker someone had and how that translated into actual, discreet measurements. After reading what food writer Michael Ruhlman had to say on measurements, I began to think in terms of ratios, not quantities. After some experimentation with different brewing methods and proportions, I think that I finally hit the magic ratio… 1:15. 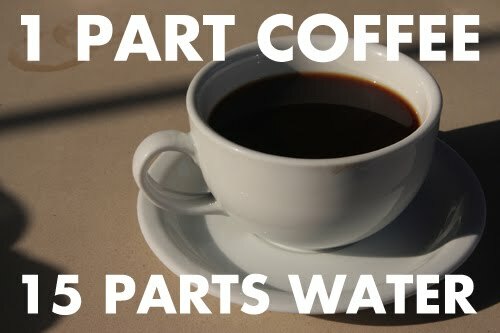 1 part coffee to 15 parts water by weight. Now, this means that you’ll need a scale to weigh your coffee. But the good news is that an accurate digital scale can be had for $20 - $30 and it’s a very valuable tool in the kitchen for things other than weighing coffee. Recipes (particularly baked goods) come out more consistently when the ingredients are weighed versus portioned out volumetrically. Ever try to scale up a recipe? It can be a nightmare when you’re dealing in teaspoons or pints or cups. Also, bonus points for never having to sift flour ever again. Now, back to coffee… if you know how much brewed coffee you want, you can either weigh that amount of water, or just take the measurement in milliliters (mL) and divide it by 15 and you know how many grams of coffee are required. One beautiful thing about the metric system is that 1 mL weighs exactly 1 gram. It’s much more logical than the imperial system. I’ve tried the 1:15 ratio with various methods of brewing and it consistently delivers, whether you’re making coffee for yourself, or twenty of your closest friends.